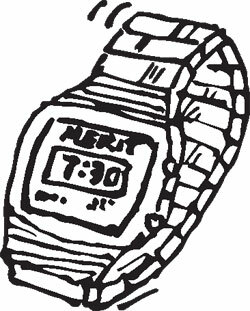 Before there were digital movies, before you could stream cat videos directly to your brain, there were digital watches. 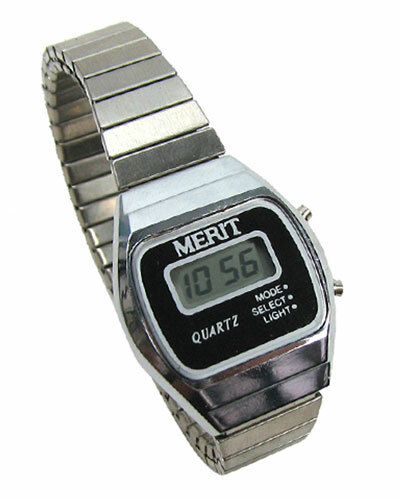 And now, direct from the shoulder-padded 1980s, we bring you digital quartz wristwatches, complete with date/time/second functions on a back-lit LCD screen. In goldtone with expansion bands. From the semi-legendary MERIT company, and check out the prices on eBray. Ours are new-in-the-box, (but need some batteries and a little tlc to get them to work) complete with AG3 batteries that are deader than Warren G. Harding. A great collectible! Add our pack of assorted batteries that includes AG3! 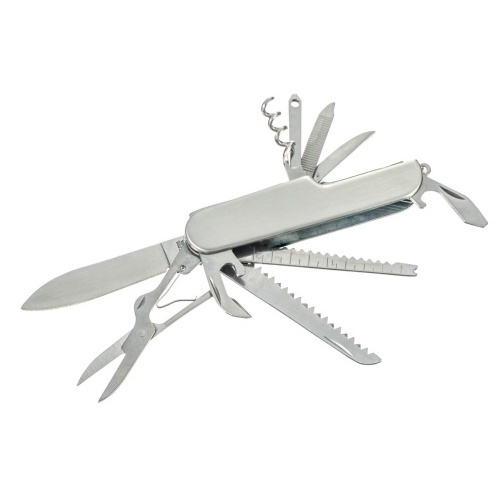 Nobody would dare vote you off the island if you have this stainless steel survival tool. 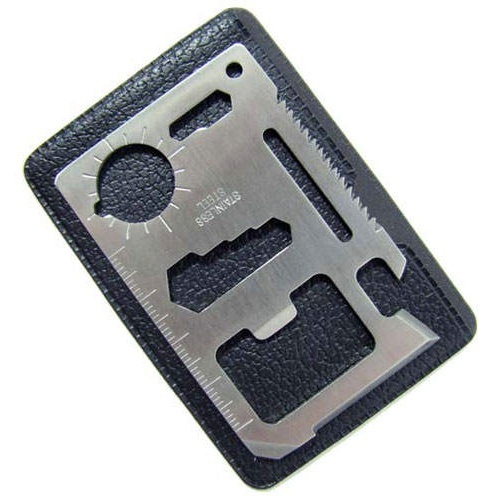 Smaller than a credit card at 2-3/4" x 1-3/4", it has (11) functions: can opener, knife edge, flathead screwdriver, small ruler, bottle opener, 4-position wrench, saw blade, 2-position wrench and a couple more. Slip it into your wallet or hang it on your keychain, then go get lost. It's a 10-tool Swissesque military survival knife, but without those red plastic handles to break and fall off. Includes stainless steel 2-1/2" knife blade, flathead driver/bottle opener, saw blade, scissors, can opener, fish scaler/nail set, corkscrew, Phillips driver, awl, nail file and the needle-like thing for making buckskin clothes in case you're lost for years. Has a split ring to hang your keys from. Perhaps you need a silicone coin purse, or perhaps you just want one on account of their being such cute little bulbous things with their double-ball closures. Plus you can keep anything you want in it. Ours measure 4” x 3” x 1-7/8” with a metal frame and a very pleasing, smooth feel. You pick lime green, warm red or robin’s egg blue. Four carabiners, no waiting. These are for keys and stuff, not for hanging around Mt. Everest. 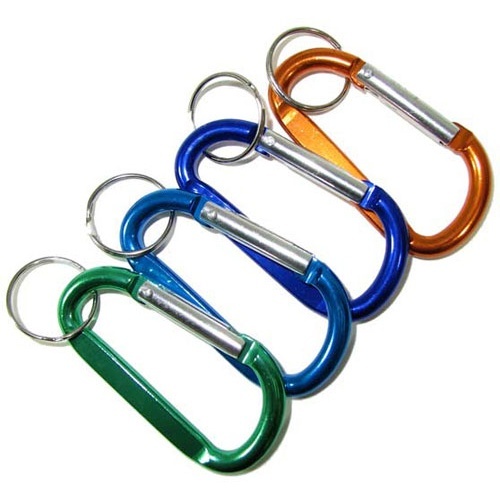 We'll pick a quartet of 2-3/4" x 1-3/8" carabiners in assorted vibrant anodized-aluminum colors, including black and polished silver. 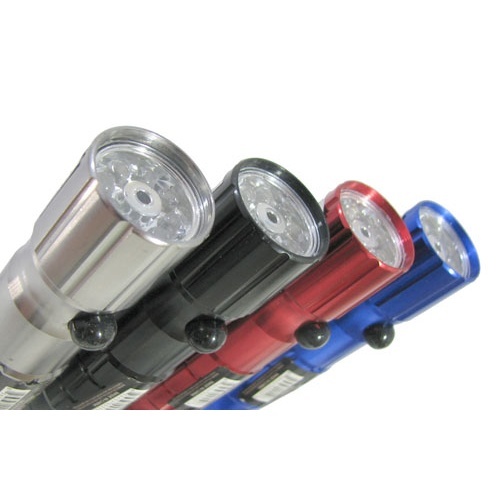 They open to a max of 5/8" and each has a complimentary 7/8" slip-ring at absolutely no extra charge. Nothing says camping tragedy like having no place to hang your water bottle when you're stalking elusive critters. 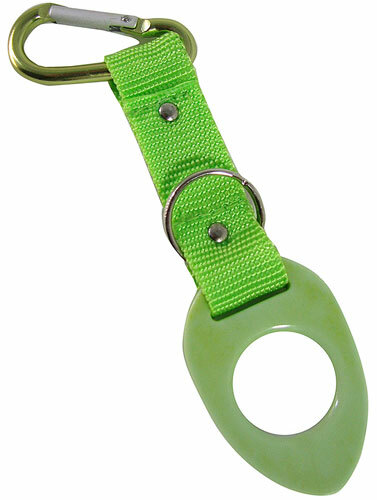 This 2-5/8" assorted colors aluminum carabiner has a canvas strap with a rubber gasket on it to grab onto the top of your standard water bottle with a 7/8" cap. This makes it great for biking and hiking, too. Also has a slip ring for sundry other stuff. Got A Little Work To Do? Get our littlest pocket work-light. Just 2” x 1-3/16” x 3/4” with a single white intense COB LED, and (2) button-cell batteries (included), it’s about the size of a really thick domino tile. Has a little magnet on the back, too. You’ll get a pair in red, orange, green or blue. 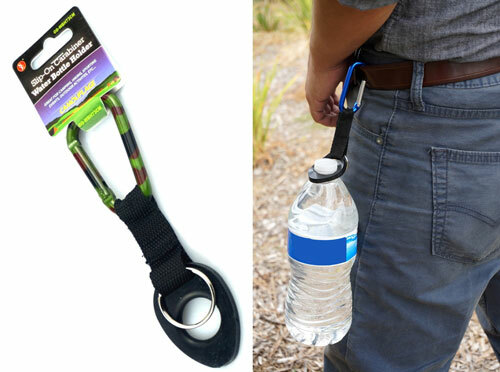 This 6" long water bottle holder has a 2" aluminum carabiner and is attached to a 2-3/4” long canvas strap, with a 1” slip ring and a soft rubber planchette-like, plectrum-ish, egg-shaped thingie 2-3/8” long with a 15/16” hole in it. What for? Our Asst VP for Saying Planchette says that is the portion to slip over the top of the water bottle. The whole shebang is in a hard-to-lose neon green. 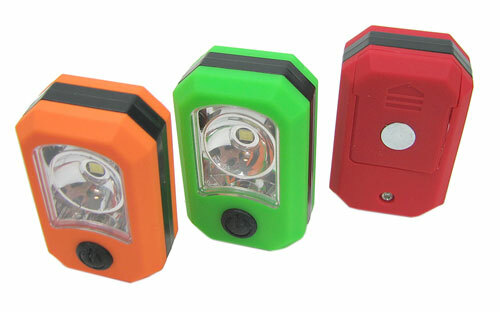 A bright little flashlight with (8) super-bright white LEDs in a circle and a less-than-5mW red laser right in the middle. One click and it's a flashlight, another click and it's a laser pointer. (Note: flashlight and pointer can't be on at the same time.) Measures 4-3/8" long x 1-1/8" dia in assorted colors dark silver, red or blue aluminum with knurled grips at both ends. Lasts 30 hours on a set of new alkaline batteries (3 "AAA" heavy duty batteries included). 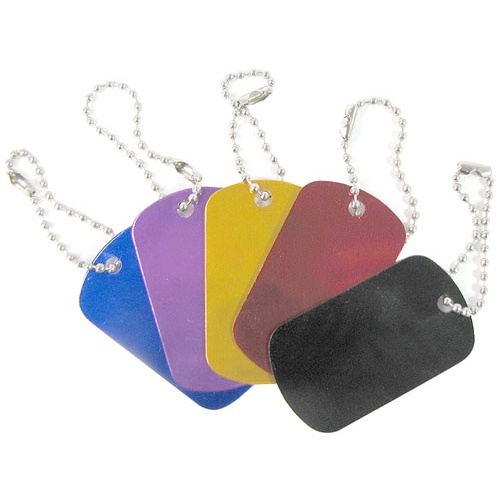 Our each is a dozen unmarked anodized aluminum dog tags, 2" x 1-1/8", on a 3" ball chain. Colors include silver, gold, red, purple, blue and black. Nice for ID tags and ready to be engraved, or written on with indelible marker. 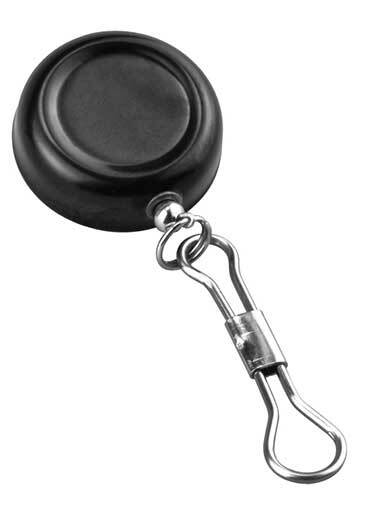 This small, clip-on, retractable cord reel measures just 1” dia x 3/8” thick, in black plastic over steel, with its spring clip on the back. A very thin nylon cord pulls out to reach 18-1/2”, with a closed wire loop at the end to hold a key or whatever (think: name-badge holder). Doesn’t lock open, so just pull it out and use the attachment, and it automatically retracts when you let go. We had a sixth-grade nun with one of these, but we never knew what the key was for.